This was again an exceptional year with rainfall above normal and extended into the spring. It was very nice to see some areas of green grass still in late May as we finished up our spring production clipping. Both the west side and east side rangelands were well above the normal forage production reported in the soil surveys. The west side ranged from 120% to 170% of normal with one site almost 300% of normal. This equals roughly 2,000 lbs/acre up to almost 7,000 lbs/acre for the most productive site. The east side was equally as productive with most sites ranging from 110% to 250% of normal, ranging from roughly 1,900 lbs/ acre upwards of over 5,500 lbs/acre. Unfortunately we also saw an increase in the weed medusahead as we drove all of the back roads. I doubt that there is one ranch in the area that is not affected by medusahead to some extent. Just as a side note, there is a new program that will be offered through the Natural Resources Conservation Service that we here in Cooperative Extension are putting together. It will be an Integrated Weed Management Program (IWM) and will be a tool for you to use to identify, prioritize, and control three of our big range weeds: yellow starthistle, medusahead, and barb goatgrass. Please be sure to look in future Field Notes for more information as the program becomes available statewide. Every year weed management should be a top priority on pastures. Ensuring that you do not have any new weeds slowly coming into your pasture, or small patches that are now starting to explode and take over the pasture. Weeds can be a nuisance by outcompeting more desirable forage species as well as sometimes being poisonous to livestock. One of these weeds that has moved from a low level nuisance to an explosion taking over irrigated pasture is buttercup, primarily bur buttercup or roughseed buttercup. Right now you can see a yellow carpet in irrigated pastures that are infected with buttercup. Buttercups can be poisonous to livestock, horses, goats, and cattle but poisoning does tend to be rare, mainly because livestock typically do not choose to graze buttercups. 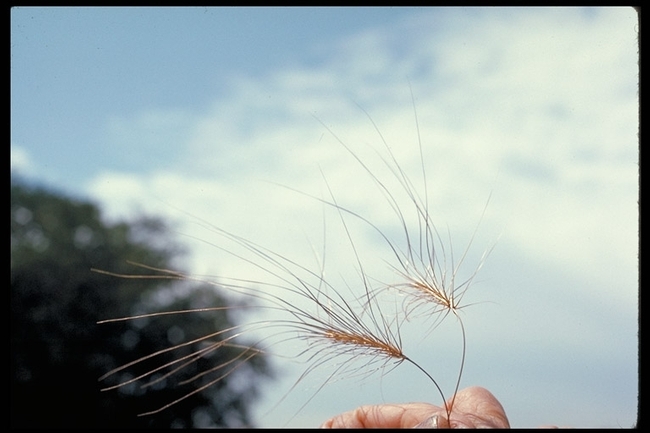 Management options should be geared to reducing the seed base of the plant. Buttercups are an annual plant, so if you are able to control and reduce seed production this year, you should see less next year in your pasture. Three options to consider are: mowing, chemical herbicide treatment, and changing grazing management. Mowing early before seeds are developed is one easy management option. Using whatever mower you have available, tractor pulled mower, lawn mower (riding or push), or a weed eater can all be successful at helping control weeds. Herbicides typically are what people want to go to first. But they may not be the best tool to use, they may be a part of the strategy. Most chemicals that will work well on buttercups will also damage your clovers as well, so careful consideration should be taken when deciding to move forward with chemical control. If you are interested in discussing chemical control, feel free to call me to discuss options. The last option for controlling buttercups, and any other weed, is good pasture management. Weeds normally do not compete well in an established pasture. Having the flexibility to change grazing management where forages can be not grazed as heavily early in the season can allow grasses to outcompete and shade out buttercups that are just starting to grow. Healthy pastures are resistant to weeds of all kinds. Have only a few acres and think there is nothing you can do? Try using portable electric fencing to easily and cheaply create pastures for a rotation system. Good pasture management is the best option for long term health of the pasture and weed resistance. The other tools can be used to help you get there faster, but nothing can replace the value of good management for providing a healthy pasture for your livestock.